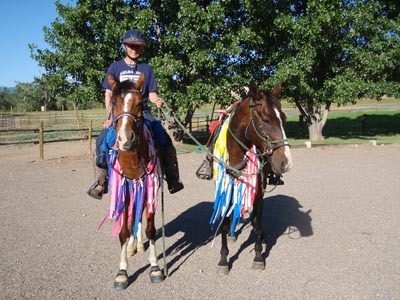 It's not all just schooling together, eating and hanging together, and romping together; the two BFFs, Stormy and Tex, sometimes work together, too. 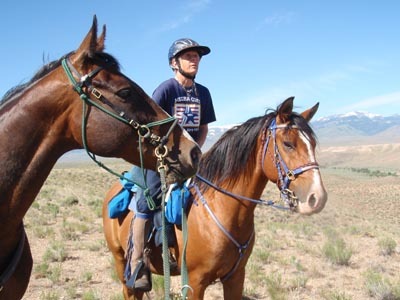 Today their assignment was to mark the last bit of trail (as in, a whole 3/4 mile of trail) for the 2-day Owyhee Cheap Thrills No Frills endurance ride this weekend. Since the convoluted in and out trails from base camp required a bit more concentration, I made the ribbon Hula Skirts (in honor of our friend Dudley) the night before. 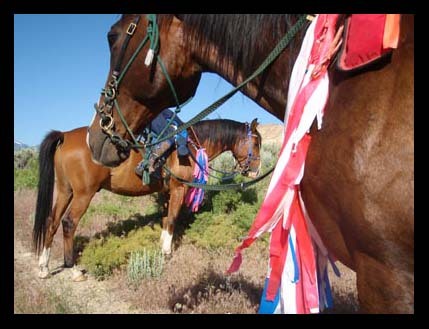 Tex would mark the Out trail with his 3 colors, and Stormy would mark the In trail with his four colors. Tex had never worn a Hula Skirt before. It didn't faze him in the least. 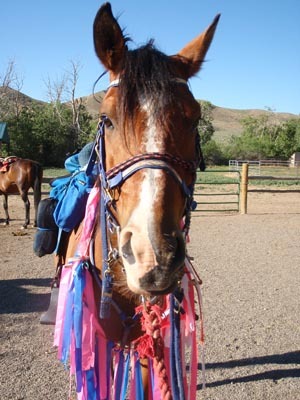 Besides, his Bud Stormy was wearing one and it didn't bother him at all. 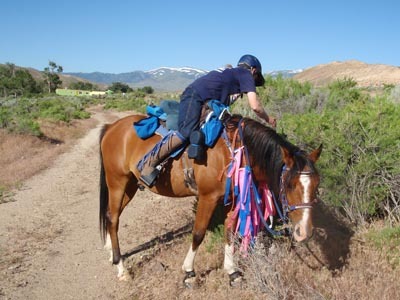 The boys did the hard work - standing still - while Linda and I untangled and picked out the right ribbons to pin onto the bushes in the correct directions. Having completed their assignment, the boys surveyed a job well done. They'll sleep well tonight, knowing riders won't get lost for their hard work (on 3/4 of a mile of trail! ).